2017 was the third outing for the new festival. 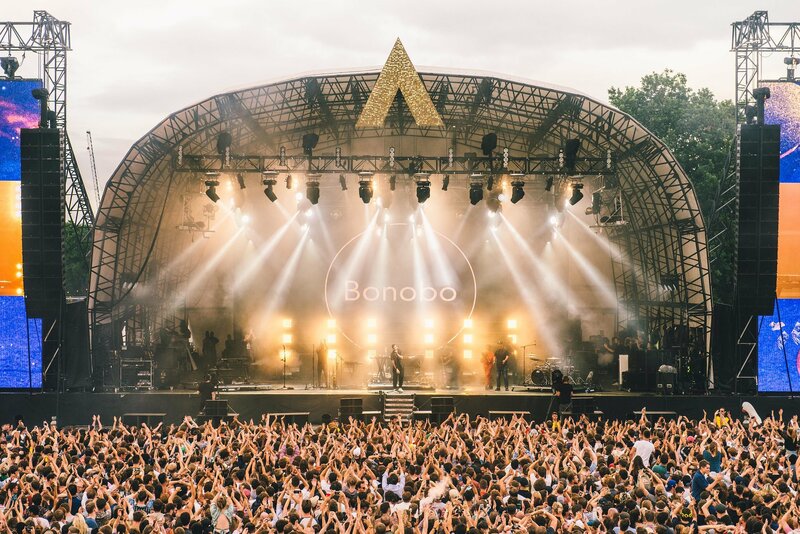 The inaugural proceedings kicked off in 2015 with the stellar pairing of indie stalwarts Ben Howard and Bombay Bicycle Club. This was followed in 2016 by no less than a band many consider to be one of the greatest live acts going: that Icelandic band that did the music for that Planet Earth advert that one time, Sigur Rós. It would be fair to say that Citadel is fast becoming not only a revered institution on London’s festival scene, but the UK’s too. With a cider in one hand and a pulled pork burger in the other, we went down to check out the bands we knew and loved, as well as those we didn’t know we loved yet. Because somebody’s got to, dammit. In true ‘indie festival on a blue sky Sunday’ style, Charlie Straw warmed the stage and our hearts up with his pleasant blend of jangly, emotion-wrenching guitars and delicate vocals, providing the perfect soundtrack for the audience to find and settle into their spot on the grass, warmed from the morning sun. Occasionally unexpectedly strong drums put a spanner in the otherwise relaxed works. Duo Ardyn channelled the good old times with their nostalgia-tinted tunes. Though occasionally overstepping the squeak at times, the strong, driven female vocals led the two-piece’s efforts for the most part. Old-school harmonisation and guitar strumming taken from a road trip along the seventies L.A. coast had the crowd yearning for the simple life, whilst finely packed drums and soothing backing vocals further showcased the band’s talent for time travel. His haircut showed a fondness for James Dean and deep, powerful baritone vocals were not far off that of Johnny Cash’s, yet the juxtaposition provoked by his getting the best out of an array of distinctly modern looking synths and drum machines made Joseph J. Jones an intriguing and thoroughly entertaining proposition. Whilst the lyrical content might not have been anything new (his east London accent informed us his song ‘Speaking In Tongues’ was about his “religious nutcase” of an ex), the often scatty drums, thrumming bassline and booming vocals had the crowd – sometimes literally – quaking in their boots. One could argue that some moments were a little too “X Factor”, perhaps extending the vocal note longer than necessary; another could just as easily argue this was Jones merely making good use of the clearly impressive talent (and lungs) he has been blessed with. Quite right too. The dark, bewitching murmurings achieved by the drum machines ensured matters were kept the right side of cheese, making the set a haunting, moody affair. Compared to Joseph J. Jones’ self-styled deep, sultry gazing into the middle distance – probably in a bid to keep everything mysterious, enigmatic and marketable – singer-songwriter Jake Isaac was the host of a raucous party that seemingly everyone was invited to. Isaac and his band conveyed a love for their music, their band mates, perhaps even their life at large. There was real life laughter and plenty of eye contact. It was like the camaraderie Simon Cowell forcibly pumped into the blood of the One Direction boys. But genuine. It had the effect of making the audience feel like they were part of the band, and that they too were riding the ascent to the top. It was a joy to watch and be a part of. Those in attendance legitimately sung and danced, probably catching a few murmuring, nodding Londoners by surprise. There was real variety to the set list: one moment everyone within hearing distance was singing to a chorus, the next Isaac was intimately crooning away. The band brought their finesse to the drums and funk to the bass before the set came to a close with a boisterous instrumental, culminating in most of them gallivanting around the stage in a way more expected of Download. Luckily for those of us who struggle to remember what exercise is, Stevie Parker slowed the tempo right down. Playing in the intimate Kopparberg Urban Forest with most of the audience sat cross legged on the grass with cider (of course) thankfully in hand, it was as if Parker was playing amongst friends. Her vocals – all tender and slight in force – were melancholy and evocative. The backing band fused the classic with the electronic and current, at times producing an elegant wall of noise. The sound was unique and certainly worthy of attention to start but, with Parker and her band barely animated and the songs starting to blend into one another, the attraction and intrigue initially stirred began to wane, even despite their willing the audience to get to their feet. Parker could well be the muse of RY X. There are similarities between the two: both singer-songwriters, both producing music capable of provoking tears of happiness and sadness, both evidently affectionate souls. Whilst RY X was almost as still as Parker on stage, there was a certain gravitas merely to his presence; from walking onto stage wearing a long black jacket and dark sunglasses just as the strings started to do their thing, to him walking over to each of the several sections he had for a backing band to silently acknowledge his appreciation of what they're up to during an especially exquisite instrumental. The songs, though probably getting near to the double digits in length, kept the crowd hooked and captivated. From the swooping of the strings to the drums that shook the ground beneath us, there was theatre to RY X as a musician as well as a personality. While it was clear he was trying to retain some cool and intrigue (read: long black jacket and dark sunglasses), he did allow some emotion to creep in with an occasional falsetto vocal Bon Iver would be proud of. Even more rewarding, though was the smile that slowly built onto his face as him and his band came to their gorgeous crescendo for the set’s last song. 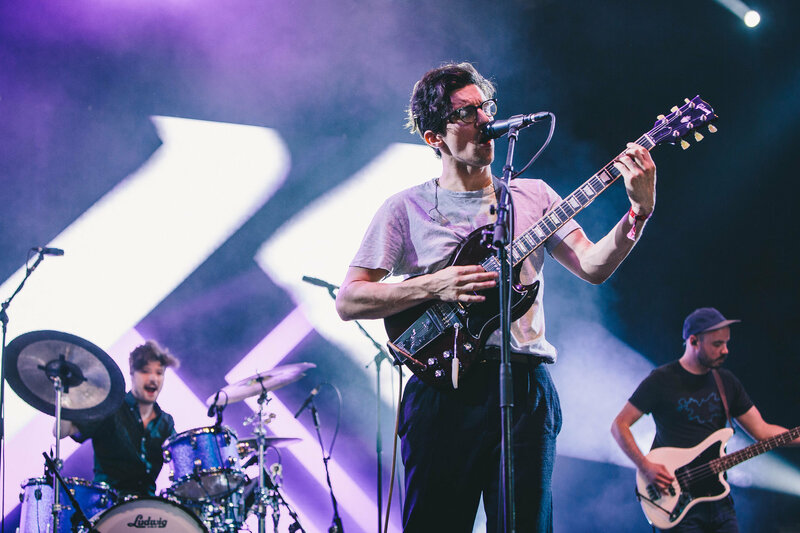 Bringing us and our fraught emotions back down to earth with a bang was Dan Croll. Or, rather, the technical difficulties he initially endured. Once started there was clearly a defined purpose to the performance. The drums on ‘One Of Us’ had punk undertones, and the guitar solo was one the drugged up, hedonistic rock’n’roll eighties would have been proud of. Despite Croll visibly being miffed about the set that could have been, going onto announce they were to pack up sooner than they’d have liked thanks to the earlier difficulties, ‘From Nowhere’ went on to prove itself a crowd favourite. Tambourine slapping in time, Croll allows himself an enthused jive here and there, the audience were evidently more than happy to reciprocate. Despite mysteriously appearing at very respectable heights on festival bills while having no music in the public domain, nobody knows who – or what – A Blaze of Feather is. Or at least they didn’t until April of this year. Prior to being revealed – via no less than an exclusive with The Independent – to be a project-come-band of aforementioned indie stalwart and Citadel alumni Ben Howard, A Blaze of Feather was all Reddit investigations, subtle epic tones, and artistically shot film. How times have changed. A nice fluorescent sticker on a well-positioned amp let the building audience know that the gear did indeed belong to a Mr. Ben Howard. Despite walking on stage with a shrug and adopting a seemingly low-key position towards the back of the stage, the frequent calls of, “We love you, Ben!” confirmed there was a preconceived star. It soon transpired that focusing on only one man was an injustice to his five deeply talented bandmates. The initial mood adopted was a sullen one. The audience were going to have to be patient – there were grumbles from frontman Mickey Smith, long, arching strokes on India Bourne’s cello, Kyle Keegan only extended the use of his drum kit to a few tentative taps here and there. Lo and behold, patience is a virtue. Once warmed up and in full flow, the band were creating slow building songs of such epic proportions it was difficult not to be swept up in their sheer talent. Mickey might not be the most dynamic singer – his vocals barely extended beyond a mumble between slugs of Jägermeister – allowing each instrument to shine. The group are clearly close-knit, musically and personally. One got the impression the band were jamming, just they happened to be playing at a festival and we happened to be watching. The lyrics clearly had highly charged emotion entwined, matching the grandiosity of the music they sat alongside. A woozy rock number urged the nation to remember we are, “one people,” one of more serenity was, “for those who have lost someone but still carries them in their heart.” It was telling that upon it starting to rain, no-one put up their umbrella, no-one left to find shelter, no-one took their eyes off stage even for a moment. It soon became clear who most attending the festival were here for. Upon producer Bonobo finishing his beat and bass-heavy set with live band in tow, there was a surge of people edging towards the areas nearer the stage. Before things kicked off, there was just as much talk of how compelling of a live performance the next band puts on as there was of how sticky and sweaty the evening’s hot air was. Soon enough Yannis Philippakis, lead singer of the band Foals, enters the stage alone, guitar on hand. After a few crowd-baiting seconds tick on by, the rest of the band join him, soon launching the recognisable strums of the epic ‘Mountain At My Gates’. Within an instant the mammoth crowd was swaying not as individuals but as one collective mass. 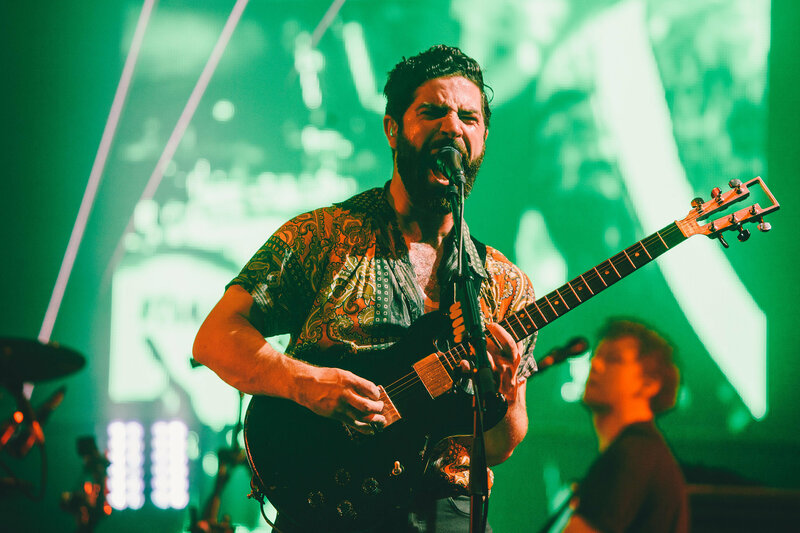 Philippakis was clearly the night’s ringleader and enjoying the privilege of being showman – him and his guitar were dancing, arms raised, building hysteria. 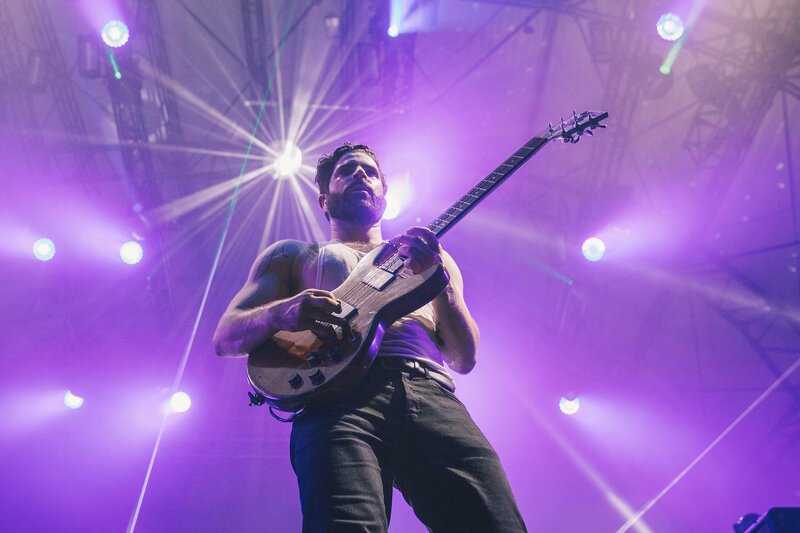 It says a lot that the opening of mosh pits provided respite, only to come crashing back down as the band unleashed the monstrous riffs of ‘Snake Oil’ and Yannis screamed his lungs out as the song hit its peak. 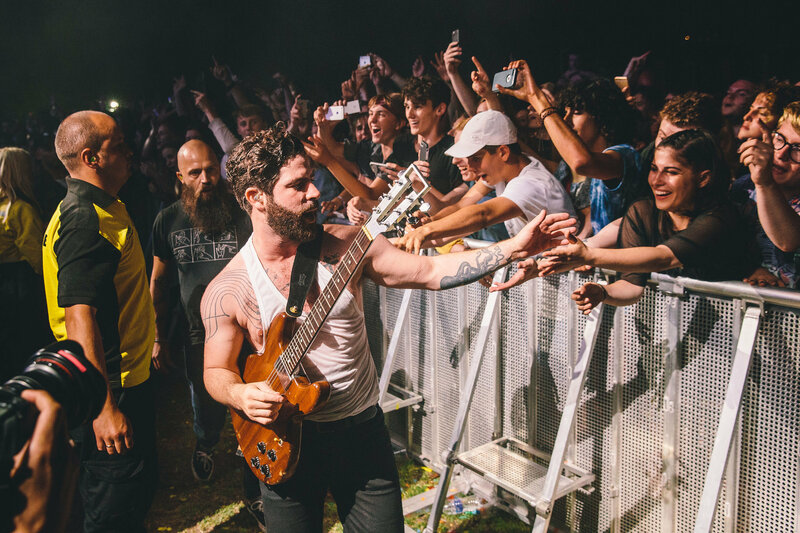 The chirpy ‘My Number’ converted the moshing into bobs of approval as Foals displayed their trademark guitar plucks that are surely nearing synonymy. ‘Spanish Sahara’ allowed the band (and the audience) to catch the breath they're desperately in need of, providing a nice moment of both relief and reflection as dusk transformed into night. After playing a few older numbers including ‘Electric Bloom’ and ‘Red Socks Pugie’ – reminding everyone of how extensive and eclectic their discography is – the band closed their set as they always do with ‘Two Steps, Twice’. Building the song slowly with the disjointed keys and rhythms that are so associated with the Antidotes era. The stage unleashed a parade of tickers and streams as the song dropped. It's an apt conclusion for the band and the festival itself; in a way a good representation of how both have evolved graciously to become must-see events. Only a fool wouldn’t keep their eyes and ears peeled for what’s next.